In order to give you a new level of comfort, we have added a layer of memory foam on top of the highly resilient base foam. This design approach enables the wedge pillow to have the desired cushion while still providing gentle support to elevate the upper body or legs, or to use as a trunk stabilizer for side-lying position. Designed for patients with acid reflux, problem breathing, poor circulation, back or neck problems, it can also be used for foot or leg elevation. This pillow provides a comfortable, gradual slope and use gravity to keep reflux down and airways open. We have received excellent reviews for our wedge pillows. This folding version of the wedge pillow is created due to many requests from our customers for not only using our wedge pillows at home but also for traveling. 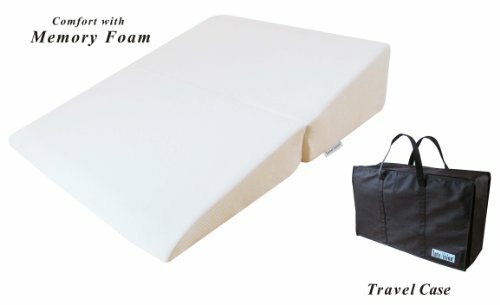 With the supplied carrying case, it is easy to fold the pillow in half and store it in the case for traveling. Every product comes with the trademark InteVision on its packaging. Note: for people who want to purchase extra pillowcases, we have just released an optional 400 thread count, 100% Egyptian cotton pillowcase (sold separately and available on Amazon). Size: 32" x 25" x 6.5"
Comes with a carrying case for traveling. Note: based on the number of people who want to purchase extra pillowcases for this wedge pillow, we have just released an optional 400 thread count, 100% Egyptian cotton pillowcase on Amazon (sold separately and available on Amazon). If you have any questions about this product by InteVision, contact us by completing and submitting the form below. If you are looking for a specif part number, please include it with your message.